in sight of what I know. Paolo Ruffilli was born in 1949. Attended the University of Bologna, where he studied modern literature. After a period of teaching, he became editor with the publisher Garzanti in Milan, and is presently the general editor of the Edizioni del Leone in Venice. 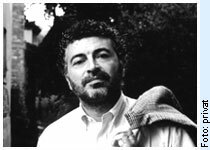 Poetry International Web presents poems of Paolo Ruffilli in original and english translations and further information about the poet.